David Brooks, the New York Times columnist who helped coin the terms “red America and blue America” in an Atlantic Monthly article in 2001, remains one of the most notable journalists writing about the changing demography of the United States. Since Brooks wrote On Paradise Drive: How We Live Now (And Always Have) in the Future Tense in 2004, the American landscape has changed even further. While the suburbs of America are still growing with more master planned communities complete with insulated McMansions resembling a rich person’s compound, downtown urban neighborhoods are growing at a remarkable rate as young people return to the city in mass hoping to remake cities in their own image. Even among philosophical and political conservatives, there is a new brand of “crunchy” conservatives who have emerged as the “pro-life vegetarian high-church Catholics who can their own preserves, care too much about zucchini, home-school their kids and read Edmund Burke while wearing Swedish clogs.” ?? A July 2009 CNBC report ranked Oklahoma No. 1 in cost of living and the state’s economy ranked third. Ranked No. 23 overall, Oklahoma is moving ahead in national rankings due, in large part, to an increase in the number of younger people moving to the state and settling in metro areas. Yet, the Association of Religious Data shows that more than half of the state’s residents give no religious affiliation at all and remain disinterested in any organized religious initiative. The annual Edna McMillan State Missions Offering targets strategic areas of need to make a direct impact on the state’s growing culture of lostness. Efforts to help mobilize ministry to Hispanics (a large and growing segment of Oklahoma’s population base); various outreaches to children through associational camps; church planting, disaster relief and ACROSS Oklahoma are some of 25 ministries supported by the Edna McMillan State Missions Offering. The 2009 goal is $1.15 million, and the hallelujah goal is $1.2 million. 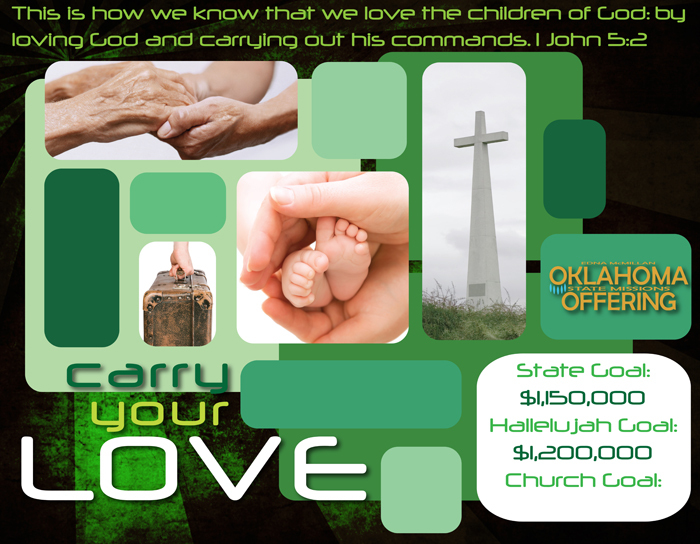 More information about the offering is available at www.bgco.org, or by phoning the Women’s Missions and Ministries Office at 405/942-3000, ext. 4335.